A ladder injury can lead to a number of expenses and damages that workers comp doesn’t cover. Find out if you can get more through a personal injury claim by speaking with a Boise ladder accident lawyer. If you were injured in a ladder accident on a construction site, you were probably led to believe that the only recourse you have is through workers compensation. It is true that this should be your first stop since workers comp will pay for your current medical bills and even provide a percentage of your lost income. However, you could be entitled to more money if your accident meets certain criteria, and a Boise ladder accident lawyer from Craig Swapp & Associates can help. Workers comp insurance is in place to protect workers, which makes it an important resource for ensuring that your medical bills are paid. The problem is that this coverage typically does not pay enough to fully compensate you. You will only receive a portion of your lost wages, which may not even be enough to pay your bills. This can result in your family struggling to make ends meet while you are struggling to physically recover. This isn’t fair, so when possible, you may also want to file a personal injury lawsuit to seek the rest of the compensation you deserve. Just be sure to file your workers compensation claim first. You need to file an accident report with your employer immediately after falling off of a ladder. This serves to prove where you were injured and how. Next, you need to visit the doctor for a full examination and diagnosis. They will put you on a treatment plan that must be followed in order to demonstrate that you took your health seriously after the injury. Next, call our office to speak with a Boise ladder accident lawyer. We will go over what happened with you, identify if any third parties could be to blame, and discuss your legal options. If you are going to sue, you must do so before the statute of limitations runs out, which is two years in Idaho. Normally, if you were injured in a ladder accident during your normal job duties, you aren’t supposed to be able to sue your employer. However, there are exceptions. If your boss or the company you work for purposefully put you in harm’s way, you might have grounds for a case. This also applies if your employer does not carry workers compensation insurance. Ladder Manufacturer – If the actual ladder was faulty, the manufacturer could be to blame. Safety Equipment Manufacturer – If you were up on a tall ladder and wearing safety gear that failed (like a harness or helmet), that manufacturer could be negligent. Other Party – Depending on where your construction site was located, other people may have been around. If one of them did something to cause you harm, he or she could be negligent. Each situation is different, so the best way to find out if you have grounds for a lawsuit is to call our office. After getting injured in a construction ladder accident, you may have more options available than you realize. 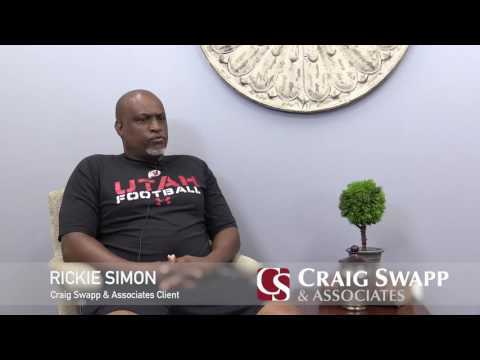 Find out if you can file a lawsuit by speaking with an attorney at Craig Swapp & Associates. You can do so by completing the form below or by calling 1-800-404-9000.